In this article we will look at vehicle graphics and livery and what they can do for your business. Of course, it’s important to be professional and business like, it’s also important to look professional and business like and smart vehicle livery is probably one of the most visible ways of achieving this. Other than the signage on your premises, vehicle livery offers the largest canvas to paint your business logo on; or rather, apply that logo using magnetic signs, vinyl graphics or even partial or complete vehicle wraps. Your vehicles are out and about, seen by existing customers and prospects, whether they are delivering to a customer or just going from A to B. People feel more comfortable doing business with a company that they have heard of – or in this case, seen around – and have formed a good impression of. Well-managed vehicle livery can help them along that customer journey. The logo that sits on your business card, stationary and shop-front will have been designed to be your companies face, its signature, how your business is most easily and quickly recognised. If it’s been well designed it should also say something about what your business stands for; slick and modern or having more traditional values, a splash of fun or seriously style conscious. 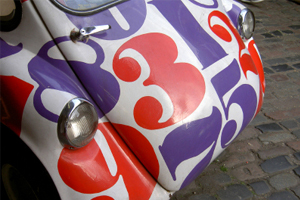 Whatever qualities your visual identity is designed to impart, then they should be translated to your vehicle livery. You can, of course, simply put the logo on the back and sides of your van and that may be the right thing to do, but think whether there are more creative solutions and ask your designer that question as well. Although there are companies that deal purely in vehicle graphics, it’s more likely that your local sign company will be who you use to design and apply the livery and it may well be that you have used them for other jobs in the past – perhaps the signage for your premises – so they should have some familiarity with your business and it’s graphic identity. You can talk to them and ask them to come up with a design solution or you can take your own ideas to them or you might have a design agency that you use to produce the graphic materials for your business. In any event, the company that produce the actual vehicle signage will have a library of plans for almost every type of van and car that they can use to show you how the finished design will look and also to give them dimensions for the final vinyl or wrap. There are three basic types of vehicle signage. Magnetic panels are the cheapest and simplest and have the advantage of being easily removable. They are simple rectangles of printed vinyl with a magnetic backing that allows them to stick to flat panels on the vehicle body. Design options are fairly limited but they do allow you to have a vehicle that is only branded when you want it to be. Vinyl graphics are the most common form of vehicle livery and consist of transparent vinyl sheets that are printed and then stuck to the vehicle panels. The vinyl has the ability to follow body curves and the vehicle plans mentioned above mean that the graphics can be accurately cut to go over or around doors, windows and panel lines. Vehicle wraps are becoming more popular as they can be used to produce dramatic and eye-catching results where it appears that the whole vehicle has been custom panted in a complex design. With a wrap or partial wrap the vinyl film is heat shrunk to fit tightly over the whole area and even side and rear windows can be covered in a two-way film. Wraps have the added advantage of protecting the vehicles paint and bodywork and can be removed when the vehicle is sold. Being seen and being recognised. The design you choose for your vehicle livery can have as much or as little information on it as you think fit. You might decide to include a phone number or web address or a list of your services or the areas which you operate in. Keeping things as simple as possible however, probably makes for a cleaner and more powerful design and you should have a realistic view of how much information people will be able to take in or note down from a moving vehicle. They will certainly recognise your business name though. You should remember that when that vehicle is on the road it represents your business. How it is driven and how clean it’s kept are qualities that will reflect on the image of your business.